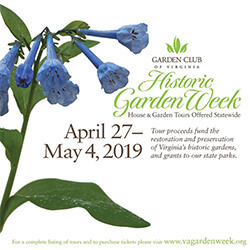 The Virginia Historic Garden Tour features historic homes and gardens across Virginia and will be bringing their tour to Albemarle on Sunday, April 28th! The Historic Garden Tour offers features five private properties located west of Charlottesville. Discover some of Albemarle’s most beautiful historic homes and gardens on this shuttle tour in the small hamlet of Ivy. Woodland gardens, a mountaintop estate, a repurposed sheep farm with a 19th-century cottage, and much more will be discovered on the Charlottesville leg of Virginia’s Historic Garden Week!